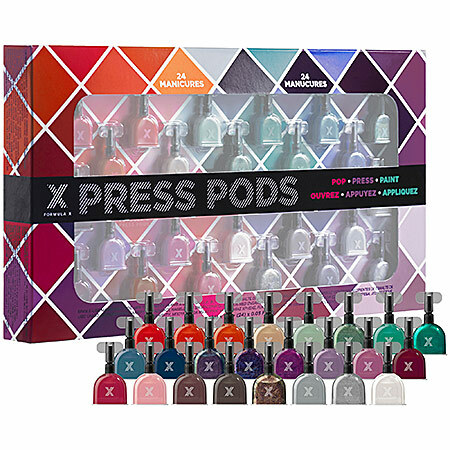 FORMULA X Press Pods, a limited-edition, revolutionary single-use manicure pod in a dazzling set of 24 bestselling shades. Flaunt a vast color spectrum with these groundbreaking, travel-friendly, single-use manicure capsules. This set includes 24 polish-filled pods in a covetable collection of standout shades, including vibrant classics, elegant neutrals, and modern metallics. One capsule of polish paints all 10 nails with two generous coats of our superior lacquer. Pop, Press, and Paint for a flawless manicure on the go. The Press Pods are one-time-use; use immediately once opened, as lacquer will dry out. The set contains single use manicure pods in Flashy (bright red), Power Source (hot coral), Kelvin (hot tangerine), Invincible (warm vanilla), Unmistakable (pastel jade), Rocket Fuel (metallic graphite green), Prism (mermaid green pearl), High Frequency (bright turquoise), Continuum (sky blue), Omni (beach ball blue), Infamous (teal and purple metallic duochrome), Legend (maroon and rainbow metallic duochrome), Harmonics (deep lilac), Perfection (smoky violet), Pedal to the Metal (pearl violet), Heroic (lilac and gold metallic duochrome), Hercules (hot rose pink), Potent (carnation pink), Riotous (dark magenta), Outrageous (lavender mist), Gray Matter (charcoal gray), Extraordinary (iceberg gray), Need for Speed (metallic silver), and White Matter (opaque bright white). The FORMULA X Press Pods are available at SEPHORA for $39 . I love the X formula nailpolish, the quality are amazing! The brand only arrived this year at Portugal, but already have lots of fans. Different colors, textures, nail care and treatments, we can choose everything, i’m so happy that Sephora could bring this amazing brand to us. Interesting. I will have to check this out. Love this idea, wonder if it’ll come to the UK any time soon?